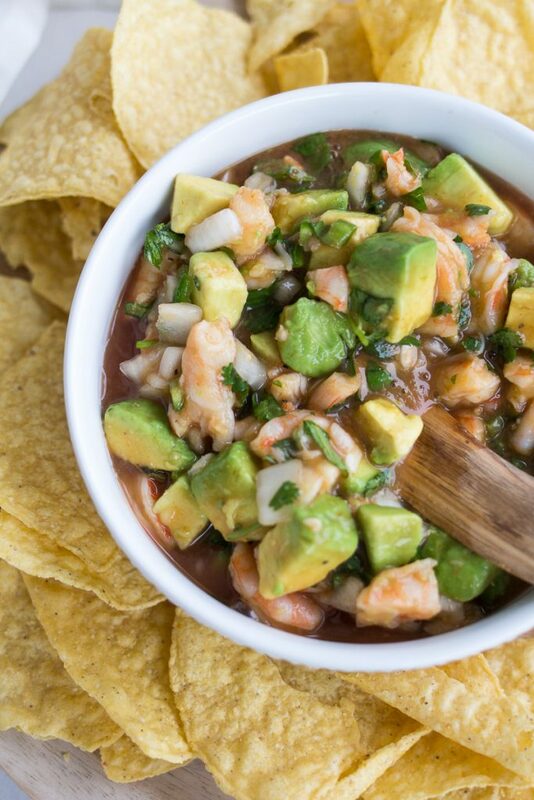 Shrimp and Avocado Salsa is probably my favorite appetizer of all time. 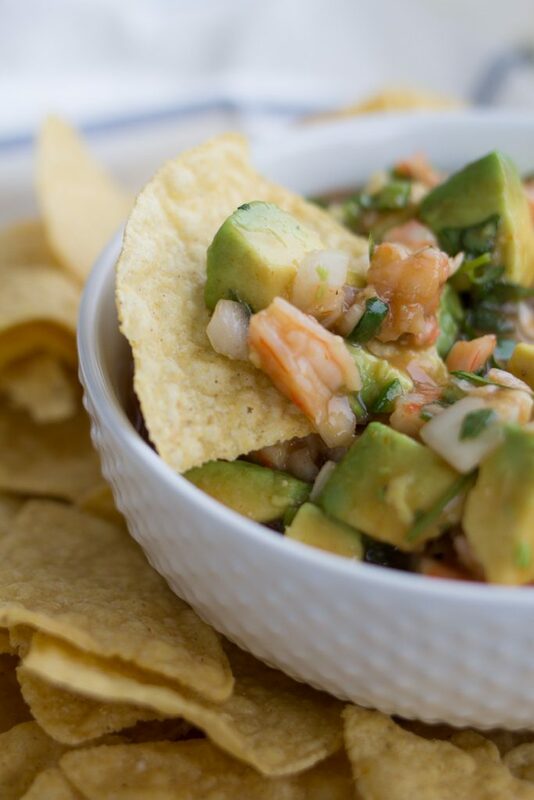 I love shrimp, and paired with salsa and tortilla chips, is a match made in heaven! I was also able to attend the International Food Bloggers Conference in Seattle. Yes, a conference just for FOOD bloggers. Since I haven’t been to a blogger conference (ever) I was wondering what to expect? I was pleasantly surprised. It was: food food food, gifts gifts gifts, fun fun fun. Who wouldn’t love that? Seriously, three days of 300 women, (and a few men) talking about food blogging, taking classes, collecting an IN-sane amount of gifts from vendors, eating from morn until night, and taking pictures of food. Want to hear the funniest part of the conference? Before eating, people were almost reverent about allowing the food to be photographed. If someone showed up after the initial photos were taken, and people were dishing up food, they would step aside and allow the food to be photographed again. No weird looks while photographing, or impatience while waiting in line to dish up a plate, just mutual understanding.Hell-o. THESE ARE M Y P E O P L E!!! Top l-r : Four cute food bloggers I met at lunch one day, trying out some fun new food products, the SWAG bags, and yes, it was bags. Plural. As in- I had to buy another suitcase to get everything home! Tasting before dinner one night from Alaska Seafood featuring Alaska Halibut Corndogs, Buffalo Alaska Cod Quesadillas, Sockeye Salmon and Bacon Wrapped Scallop Sliders. 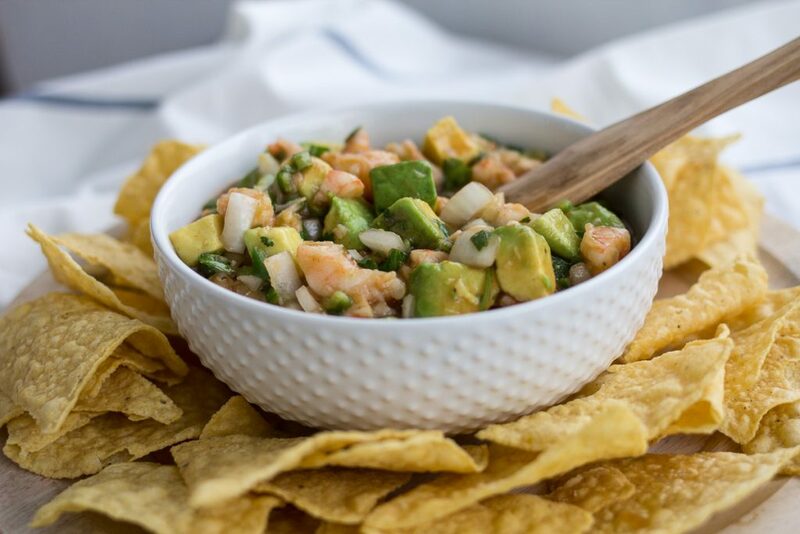 In honor of my recent visit to Seattle, I’m sharing (my daughter Corrine’s) Shrimp and Avocado Salsa. This is one of our family favorites. Corrine has been making it for a few years and it’s become one of those recipes. You know the dish that you make once and then get assigned to make for EVERY party from that time forward because it’s just So. Darn. Good. Yup. This is that recipe. 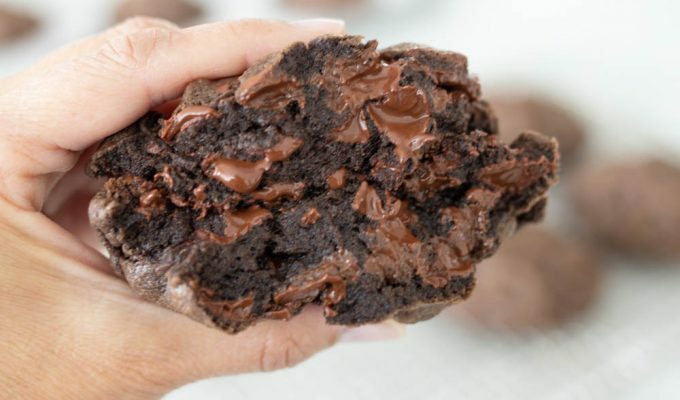 I’ve had people text, email and call me for this recipe. 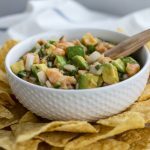 If you’re not a seafood fan,you may want to reconsider, even seafood haters tell me they love Shrimp and Avocado dip! The day before serving, remove shrimp from freezer and thaw in refrigerator in bag (see note below). Pull the tails off shrimp and devein the shrimp if needed. Chop the shrimp into large chunks, place in large bowl. Squeeze the fresh lime juice over the shrimp. 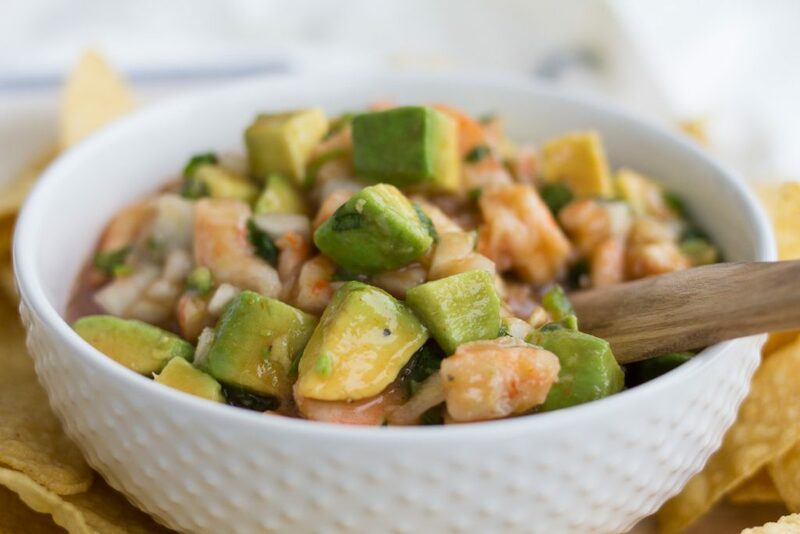 Place the chopped onion, cilantro, chilies, avocados, red pepper, hot sauce, ketchup and Worcestershire into bowl with shrimp.Season with salt and pepper.Gently fold the ingredients together. Chill until ready to serve. -Plan ahead when making this dip. The best way to thaw the frozen shrimp is to leave it in the fridge overnight. If you forget and try to run it under cold water to thaw, the shrimp can take on a water-logged texture.-If you like your dip more saucy, add another 1/2 to 1 cup of ketchup.-This can be made up to about 6 hours ahead of serving. Holy smokes. This looks AMAZING. And what a fun trip!! Seattle is such a great place. I love shrimp and avocado. Can't wait to make this for a holiday party this year! Adell, It's a great appetizer because it can be made any time of the year, always a big hit at holiday parties!